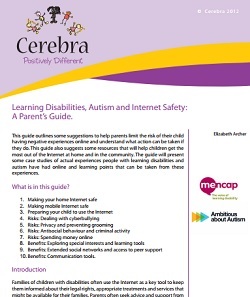 Some good sites to visit if you want to get up to speed with online safety and how to help your child or young person with additional needs or disability protect themselves online and on social media. The Department for Education has produce dupdated (July 2017) advice for parents on cyberbullying. It provides advice and information about how to protect their child or young person from cyberbullying and how to tackle it if it happens. Disabled children and those with special educational needs are more likely to experience cyberbullying, less likely to be able to use the internet and less likely to have support to use the internet. 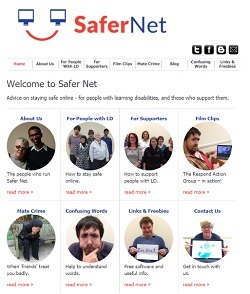 Website owned and managed by the charity Respond on behalf of Safer Net – a national Network of groups and campaigners, who want to support people with learning disabilities to stay safe when using the internet. There are top tips for staying safe and links to freebies and safety/security sites. This staying safe online guide is full of useful, easy-to-understand tips and checklists and pictures. It includes step-by-step help on how to get started on social media sites such as Twitter and Facebook and how to write a safe profile, as well as using Skype and email – and what to do if things go wrong, such as blocking users or reporting abuse. There’s also a section on web cameras. Like to be a better online parent? CEOP’s website www.thinkuknow has lots of resources forparents and carers and teachers as well as for children, starting with 5-7 year olds up to young people aged 14-18. The teachers resources section has an SEN section too, with films, cartoons and presentations to help get the online safety message across. There are also BSL-interpeted resources and videos with audio descriptions. There are tips for how to talk to your children about what they are doing online, the risks they face, plus information on the tools available to keep them safe. The website also covers the rise of selfies – and sharing revealing photos or videos – and how to get help and support.